We're bringing the traditional model of mentorship into the 21st century. In five years, 50 per cent of the workforce will be made up millenials. The scary thing? There is a big disconnect between the generation that created social media and those at the top running the companies. At least until now. I've always referred to myself as an entrepreneur by mistake. Growing up in Northern Ontario I could never have imagined where I'd be today, but then one coffee conversation changed my life. I met Mia Pearson, co-founder of Toronto-based public relations agency North Strategic in 2008. I saw her speak at a conference and was inspired so I gave it a shot and invited her for coffee. To my complete surprise (and relief) she agreed. We talked a lot about life and how to live it. But we also talked about this idea I had to better connect students and brands. 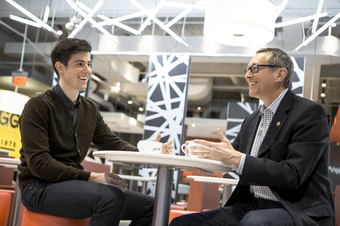 Living on campus at the University of Waterloo, I saw a lot of world-class brands talking at us, past us, around us, and telling us what they thought we wanted to hear. None of it was engaging us in meaningful ways. I saw the opportunity to change that, and I could see that Mia was interested. My energy was pumping. I could feel an opportunity coming my way. I was hoping that she would offer me a job. She looked at me across the table and said, "I'd like to hire you ... but I'm not going to. You need to start your own company." That experience was so powerful for me, and I want to share it with other young people. That's how Ten Thousand Coffees came to be. Ten Thousand Coffees is on a mission: to connect students, recent grads and young professionals (Novices) with industry professionals (Experts) in their field of interest, in thought-provoking, potentially life-changing conversations. My experience is an example of what Ten Thousand Coffees is all about: conversations that have the potential to spark life-changing ideas. It's the first-ever youth movement of its kind, and it's launching right here in Canada. Imagine what could happen when 10,000 people go for coffee and conversations that have never before been possible -- it's huge. Here's the deal. Everyone knows that mentorship is important. But the current model isn't scalable or sustainable. It's limited to like-minded individuals within one's personal network. Ten Thousand Coffees is changing that. We're bringing the traditional model of mentorship into the 21st century. In five years, 50 per cent of the workforce will be made up millenials. The scary thing? There is a big disconnect between the generation that created social media and those at the top running the companies. At least until now. Already, more than six hundred experts from 21 industries across Canada have joined our platform and we're just getting started. Our Experts include radio and television personalities George Stroumboulopoulos and Rick Mercer, Chris Hadfield, Justin Trudeau, Olympic Gold Medalist Mark Tewksbury, Noreen Flanagan, Editor in Chief of Elle Magazine, and John Betts, CEO of McDonald's Canada, just to name a few. Ten Thousand Coffees speaks to the needs of today's youth and business leaders alike. We know this because that's what they've told us. Ten Thousand Coffees gives Novices the opportunity to have a coffee chat with an Expert -- to share insights, get career advice, and hear first-hand how they got where they are today. Experts get to learn from the upcoming generation, what makes them tick, what they care about, and how to better connect with them. We like to think of it as a win-win because Ten Thousand Coffees is designed to unlock opportunities that may not have otherwise been possible. Ten Thousand Coffees is quickly becoming a Canadian success story. It's available to any Canadian who's open to having a coffee -- whether you're just starting out or have been around a while. Join the Ten Thousand Coffees movement. If you're a student, recent grad or young professional you can join as a Novice. If you're a leader or professional, join as an Expert. You never know where the conversation will take you.